In Pelham homes and other venues. Each host features a novel with food, drink, and décor to match. You choose the dinner you’d like to attend. Dress is Novel Attire or Cocktail. Everyone heads to the New York Athletic Club, for drinks, savory snacks and desserts, and dancing. You may attend the After Party only. Ticket sales go live September 13, 2018, at 8 p.m.
All RSVPs must be received by October 1, 2018. Indicate your first FIVE choices. Or indicate that you’re happy to attend any of our fabulous dinners! Dinner choices are not guaranteed, and are first come, first served, depending on availability. In the event that of all five of your dinner choices are not available, we will select a dinner for you. If we are able to seat you at a dinner, there are no refunds. Refunds will be issued only if there are no seats left at any dinner. CLICK HERE TO LEARN ABOUT THE 2018 NOVEL NIGHT RAFFLE ​​A TRIP FOR 2 TO THE DOMINICAN REPUBLIC WITH AIRFARE! 2018 Novel Night Tickets Sold Only Online! If you couldn't make it in 2018, you can still support the Library. The ultimate Pelhamite...is civic minded and well read...takes pride in a beautiful home... knows how to host a fantastic party. This is your year to host. This is your Novel Night. ​The Friends of the Town of Pelham Public Library is a not-for-profit organization dedicated to raising funds for the Town of Pelham Public Library. 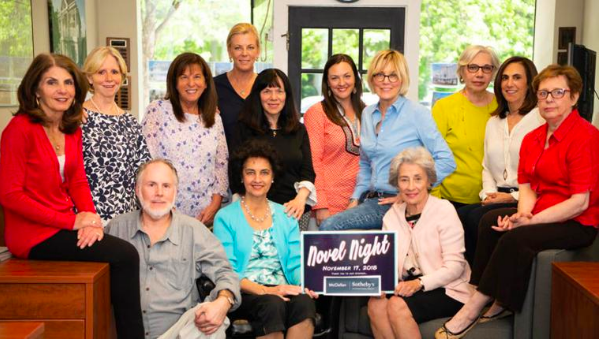 Every other year, we hold Pelham's biggest party, our signature fund-raiser, Novel Night. For more than two decades, the Friends of the Town of Pelham Public Library have made significant contributions to the Library’s annual budget. Your support of the Friends’ biennial fund-raiser, Novel Night, has made that possible. Thanks to you, in recent years we have funded a communications consultant and the Library's newsletter; staged the town-wide community read, Pelham Reads! ; celebrated the Library's twentieth anniversary; and supported hundreds of free programs for all Library patrons.